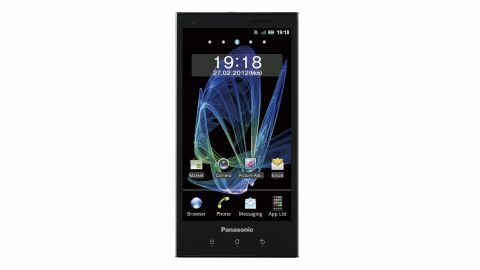 The Panasonic Eluga is the first smartphone to arrive since the Japanese electronics manufacturer announced its plans to shift over 1.5 million handsets by the end of March 2013, following its re-entry to the European market. Originally unveiled at the company's European conference in Hamburg in February, and then formally introduced at Mobile World Congress the following month, the Panasonic Eluga dl1 is available from online retailers for around £380 SIM-free in the UK (and $700 SIM-free on Amazon.com in the US, although it isn't listed on the Panasonic US site). This pitches the company's comeback handset against the likes of the Sony Xperia S and the Motorola Razr - two mobile phones that also boast the same sized display as the Panasonic Eluga at 4.3 inches. And, for a 4.3-inch smartphone, the Panasonic Eluga is tiny. It's not quite as slim as the 7.1mm Motorola Razr but, with a girth of 7.8mm, it has the same waistline as the HTC One S.
But, because it is around 7mm shorter and narrower, and its extra sharp curved edges bring its lowest thickness measurement down to around 3mm, it appears even slimmer than those competitors at first glance. And it's easily the lightest 4.3-inch-screen mobile phone that we've come across too, at a slender 103g. One of the key features that Panasonic is keen to push is the Panasonic Eluga's water and dust-proof skills. It has nabbed itself an IP57 certificate, which means that it can handle a dip into water (up to 1m and for up to 30 minutes) and that dust can't enter in a large enough quantity, thanks to the gaskets and O-rings, to cause it any bother. We didn't go the whole hog of taking it snorkelling for half an hour, but we did leave it in the sink, under a running tap, and it didn't seem to cause it any problems. On the top of the Panasonic Eluga are its only moving parts - two flaps that make way for a micro USB port and micro SIM insertion - and these seemed to keep the water out without issue. You may have already gathered from the lack of a third flap that there's no microSD option on board - a real shame when you consider that built-in storage is a rather underwhelming 8GB. The display, as mentioned, is a 4.3-inch one with a 960 x 540 qHD resolution, which puts it on a par with the likes of the HTC One S and the Motorola Razr, but it's not quite up to the 1280 x 720 standards that Sony set with the Xperia S.
It's an AMOLED display, which offers vibrant colours and great viewing angles, if somewhat muffled in crispness, thanks to a touch of over-saturation. The Panasonic Eluga's matt black or silver finish to its back means that it's comfortable to hold and won't suffer too much from smears and fingerprints. The power and volume rocker button placement isn't ideal, though. They are easy enough to access if you're operating your smartphone southpaw-stylee, but try pushing them with your right hand and you're in for an uncomfortable experience. The power button, especially, is a tricky little blighter. And we mean little. Sure, Panasonic's gunning for a slimline, minimalist beauty here - but would it really have hurt to make what is a very frequently used button (it also doubles as the sleep/wake one) a bit more accessible? Also on the back is the Panasonic Eluga's 8-megapixel camera lens, sans-flash, sadly, along with a notification of its NFC capabilities, which we'll come back to later. The front of the Panasonic Eluga keeps the sharp theme going - not just with the piano black 4.3-inch AMOLED display, but by almost seamlessly blending the screen with the thin bezel. There's not really much room for anything else up front, save for the Android control buttons, a tiny Panasonic logo, a minuscule speaker grill and a titchy LED for notifications - and if that's one too many superlatives for small, we apologise, but the Panasonic Eluga's raison d'être is its minute attributes. The Panasonic Eluga is running Android 2.3 Gingerbread for now, although a summer update to 4.0 Ice Cream Sandwich is promised. It runs via a TI OMAP 1GHz dual-core processor, which may have wowed us a bit more last year, before the quad-core revolution hit full wing.